Has there ever been a more perfect marriage than TV and games? 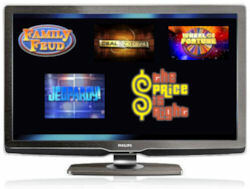 Certainly, television game shows have been among the most popular programs since the medium's inception. And of course, TV Game Shows can be turned into great board games. Nearly all of the popular game shows over the years, from Password to Wheel of Fortune to Family Feud and Catch 21, have been turned into board games. This works better in some cases than in others of course, but in general, game show games are among the very best Board Games Based On TV Shows. For kids, here's an opportunity to show up the adults; and for grown-ups, this game offers a chance to show how much-or how little-you remember from your school days. Based on the breakaway hit game show featuring Jeff Foxworthy, the Are You Smarter than a 5th Grader Board Game tests knowledge on a range of topics taken from actual 5th Grade curriculum. To come out on top, answer 11 questions that the average 5th grader knows. It sounds easy enough, but don't get cocky-maybe you'll need to cheat off of a classmate in order to answer correctly! Who will walk away with the grand prize? Will you have to admit that no, you are NOT smarter than a 5th grader? Trivia buffs and game show groupies, here's your chance to face off against the ultimate know-it-all, Ken Jennings! The Salt Lake City software engineer rose to fame in 2004 with a record-setting streak as Jeopardy game show champion, amassing over $2.5 million dollars in earnings for his 74 straight wins. And now you can challenge the champ in his exciting trivia board game! All players race against Ken to see who can reach $2.6 million dollars first, by answering trivia questions on such subjects as history, sports, science, and contemporary music. All 1200 questions in the game were posed to Ken Jennings. Can you answer the questions he couldn't? Can You Beat Ken? Join Howie Mandel, the Money Girls and the Banker to play Deal or No Deal -- in your living room! Deal or No Deal is the TV game show phenomenon that has taken the country by storm! Now you can play the DVD version at home, any time you want! Players or teams take turns opening 26 silver cases (each with a different amount of money hidden inside) and receiving offers for their own case from the mysterious Banker. When the Banker makes an offer to buy your case, you'll need to answer Howie's question, "Deal or No Deal?" The fun, interactive DVD does all the work, so there's nothing for players to do except answer the one question: "Deal or No Deal?" Family Feud Strikeout is packed with survey questions from the hit TV game show! Try to get the top answers before you get a strike and play volleys over to the opposing team. They get a strike? You gain control! Battle back and forth until somebody completes the card... or strikes out trying! Jump into the sports hot seat with ESPN Jeopardy! 1,000 sports questions will test your jock knowledge in categories such as ESPN's Players You Love to Hate, Ballparks and Arenas, NBA Head Coaches, ESPN Personalities, ESPN Original Movies and more. If you think you know the response, try to be the first player to buzz in on the electronic unit and try to win some cash. In Final Jeopardy!, the electronic unit plays the ESPN SportsCenter theme. You've got 35 seconds to respond correctly to the clue for your chance at victory! Password is the classic word association game! Teams of two square off to see who can guess the secret password first. Million Dollar Password is a modern update of the hit television show, and this version of the game also offers a three player variation in which one player gives the clues. You've got to be very clever when you communicate because players can give only one-word clues. The fewer clues given, the higher the score. The electronic timer counts down the rounds with each successive round being more difficult than the previous. The player or team that guesses the most words with the fewest clues wins. Make it to the bonus round and get five passwords in a minute and a half to win $1,000,000! Who's the fastest at guessing the secret password? The classic word association game is back in a DVD edition! Players guess passwords and score points. One team member slips on the special glasses to see the secret password, then gives a one-word clue to help his teammate guess what it is. New DVD edition combines all the fun and excitement of the game show along with the strategy and interactivity that has made the home version the number 2 best selling word game of all time. Featuring retro 'reveal glasses' to enable only the clue givers the ability to see the Password. Time is running out! Can you get your partner to correctly guess the answer by giving clues that include everything but any part of the abswer itself? If you've ever seen The $1,000,000 Pyramid on TV, then you know it can be much harder than it sounds! The $1,000,000 Pyramid Quick Pick edition packs everything from the show into a travel-friendly sized tin. This is your chance to win one of America's favorite two-team word and category guessing game! How much do you know, or not know, about your spouse? Play the Newlywed Game DVD Edition and find out. One spouse writes the answer to a question (sometimes quite personal), then the other answers the same question. Do the answers match? It's great adult fun as you play against friends or select opponents from the DVD. 1-4 couples. Ages 18 and up. "Come on down!" and play TV's favorite game show at home! DVD technology lets you experience The Price is Right game show just like a real contestant! Play on your TV and try your hand at PLINKO, Cliffhangers and the Showcase Showdown. to win! Includes 96 puzzles. 2 to 4 players. Ages 8 and up. Wholesome fun for the whole family. Relive the good ol days of daytime TV when game shows ruled the airwaves, soaps were more sanitary and talk show guests actually sat in chairs instead of throwing them!